The number of IntegraCare employees with perfect attendance increased 46 percent in 2017 compared to the previous year. Turnover in the first 90 days of the year, a critical period that factors significantly into employee retention, was down by almost 10 percent in 2017 from 2016. IntegraCare’s overall annual turnover decreased 12 percent in 2017 from the previous year. Seven of 10 IntegraCare communities saw a drop in overall turnover percentage in 2017. The largest drop in overall turnover was 77 percent in the community where the CAR Program winner worked last year. Six of 10 IntegraCare communities saw employee satisfaction improve or remain steady from 2016 to 2017. During the first year of the CAR Program, eight new vehicles were presented in January 2016 to winners at the eight IntegraCare communities participating in the contest. Last year, one overall winner received a new car, though all 10 IntegraCare communities presented three grand prizes. Hershey has had perfect attendance during his eight years at IntegraCare. 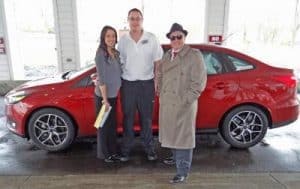 Ryan Hershey (center), a dishwasher at Newhaven Court at Lindwood, accepts the keys to a new Ford Focus as the winner of IntegraCare’s Continued Attendance Rewards (CAR) Program. Newhaven Court at Lindwood Executive Director Lori Grant (left) and IntegraCare Director of Sales and Marketing Eric Walker (right) participated in the presentation on Jan. 31. Hershey hasn’t missed a day of work in eight years at the Greensburg senior living community. Employees at 10 IntegraCare communities received vouchers based on perfect attendance during each pay period in 2017 and were entered into the CAR Program contest. The Woods at Cedar Run (Camp Hill). First prize, a 55-inch television, one-year subscription to Netflix, and one week of paid vacation. Second prize, a laptop computer and printer, Microsoft Office, and one week of paid vacation. Third prize, an i-Pad, Amazon Prime membership, and one week of paid vacation. 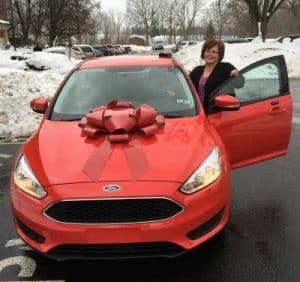 The CAR Program also enabled one previous winner to “pay it forward.” The Woods at Cedar Run receptionist Tamara Wehler won a new Ford Focus in 2016. Then, Wehler chose to better the life of an acquaintance in need, and that person in turn assisted a local church. Ironically, Wehler and her husband already owned a 2005 Ford Focus. “My first thought was, ‘Good, I can sell our car.’ But it didn’t feel right,” said Wehler, who retired after 30 years as a florist and has been at The Woods for nearly five years. She gave away her used car to an acquaintance in need of an upgrade. The cycle of giving didn’t stop there, though. The CAR Program will continue to impact lives as the tradition adds another chapter while handing out a set of new keys in 2018. For more information, visit www.integracare.com.